Home / Activities / Lonesome George, Phone Home! Just how giant are these tortoises? Consider Lonesome George, for example. Weighing in at about 200 lbs., Lonesome George is the most famous icon of conservation efforts underway in the Galapagos. Discovered on Pinta Island in the early 1970’s and thought to be the last remaining tortoise of his species, the Chelonoidis nigra abingdoni, he was brought to Santa Cruz for observation and protection. 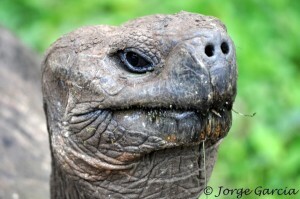 Lonesome George’s caretakers had hoped he would take interest in at least one of two potential female mates that were relocated from Isabela Island just for him. But alas! So far there are been no tortoise offspring, which means when George’s time is up, his subspecies becomes extinct. Maybe his lack of interest has to do with age, estimated at 80 – 100 years old. But scientists believe he could live another 30 years. So maybe he just hasn’t found the right female tortoise for him yet. In any case, he’d better hop to it because hopes for a baby George or Georgette are diminishing with each passing year. Yet George is hardly the largest living tortoise roaming the island. In the Highlands of Santa Cruz, we find 600 lb. domed tortoises. Imagine what it must have been like for early island visitors like Darwin to come across these huge creatures for the first time. Visitors to the Galapagos islands have described the creatures here as “other-worldly,” “prehistoric” and “primordial.” When you think about it, is there not a suspiciously familiar facial resemblance to another of our beloved, out-of-this-world creatures at play here? You be the judge, Wanderboomers. What do you think? 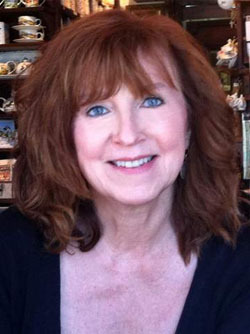 Such good memories, Nancy….Thanks. I still have pics of myself with Lonesome George. When my grandson and I returned, he gave a report on George and got an A. He was so excited. How much longer will you be there? It’s great to read all you pictorial-articles. I suspect it was the other way round on E.T. — his creators copied a tortoise! Maybe even Lonesome George. The Galapagos is still on my wish list. I just love that last picture. Great story! Cannot wait to get there myself. Hope Lonesome George hangs in till I get there! I found my mate in my mid-40s, which – relative to George’s age – means maybe there’s still hope for the lonesome guy. Then again, if he has to have prospects flown in from afar…. There’s always hope! Lonesome George obviously has very high standards – it has to be just the right chemistry – as you, too, discovered :-). That was funny at the end Nancy! He does look like E.T! I feel sorry for old George! And that one really does look like it is a saddle shell! I always wanted to see these turtles! I bet they come almost waist high since they are so large. Amazing! Great post as always! They better start match-making ceremonies for George so his kind won’t die out!! Hi, Annie ~ That’s the hope, of course, that the legacy of Lonesome George will continue. So far it’s not looking good . . . But let’s keep hope alive! He does look like ET! 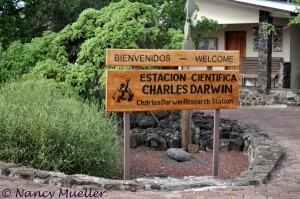 Galapagos has been on my list since I read a biography on Darwin from the 70’s. Got to get the family on the plan! Thanks for sharing George with us! The Galapagos Islands are a must-see destination for families, Eva! The kids on our cruise ranged from 3 yrs. to 18 and they all loved it – the close proximity to the animals, the swimming & snorkeling, panga rides, the hot tub and hospitality of the crew on our small ship. Hope you & your family get there soon! Ah, Lonesome George is sweet. I’ve said it before in another note reply somewhere, but the Galapagos Islands are a dream of mine. I love these posts. 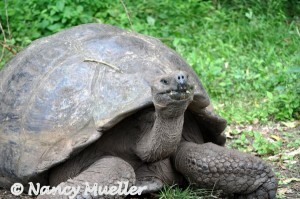 Thanks, Chris ~ Yes, I agree with you – sweet Lonesome George. He is well-loved by his caretakers and visitors, I can assure you of that! love lonesome george!! what noble creatures!! 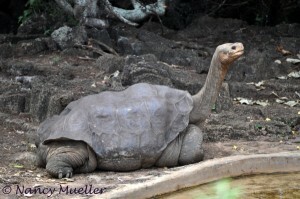 Yes, Lonesome George certainly has his followers – including me :-).